“I'm happy to be assisting Tanya and hope I can be of help to her. Despite financial and other significant obstacles, she is undaunted though not fearless, which makes her progress even that much more impressive to me. We are grateful to Todd for lending his time and talents to help Tanya and many of our clients on their journeys to self-sufficiency, and honored to have had the opportunity to serve along side of him. 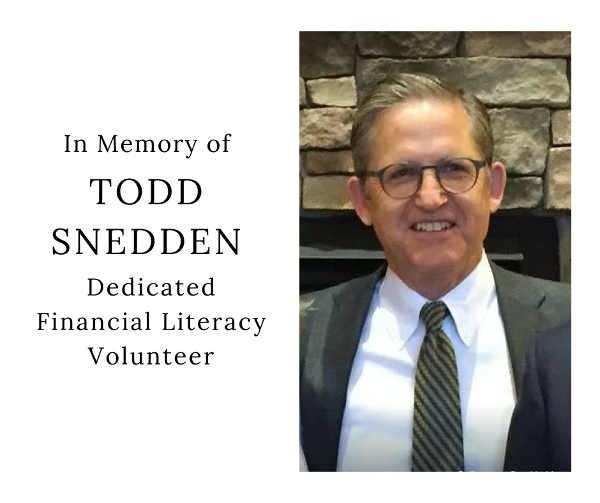 In August, we received a $5,000 contribution in his honor from a generous donor who wishes to remain anonymous, with this note: "In memory of Todd A. Snedden and in honor of the people he helped. Please use the monies in the areas he volunteered." This legacy to his service and passion for helping others succeed means a lot to us, and we look forward to helping more of our neighbors benefit from our financial education services in honor of his memory.